The screenings are being offered in observance of Oral, Head and Neck Cancer Awareness Week, which is April 7-14. No appointments are necessary for the screenings and walk-in patients are welcome. 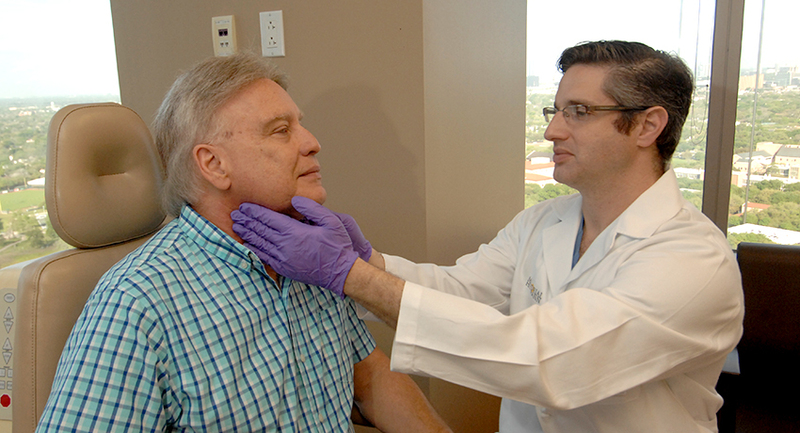 The screenings, which are painless, take about 10 minutes and are performed by faculty members in the Department of Otorhinolaryngology – Head and Neck Surgery at McGovern Medical School at The University of Texas Health Science Center at Houston (UTHealth). Oral, head and neck cancers claim approximately 13,000 lives per year. However, there is hope. If diagnosed early, these cancers can be more easily treated without significant complications and the chances of survival greatly increase. Every adult should be tested. Tobacco and alcohol users traditionally have been considered the populations at greatest risk for these cancers. However, throat cancer cases are on the rise in younger adults who do not smoke and recent research indicates this development is due partly to the increase of the human papillomavirus (HPV) virus. HPV-related oral, head and neck cancers are more difficult to detect because these cancers usually occur on the back of the tongue or on the tonsils, providing even more reason to get screened regularly. What are the potential warning signs of oral, head and neck cancers? If you have any of the above warning signs, do not wait for the no-cost screenings. Seek medical attention immediately. To schedule an appointment with a physician, call 888-4UT-DOCS.